FREE and open to the public. This ceremony highlights the accomplishments and impact the selected inductee made on the lives of those in UA and beyond. Partnering with the city of UA, we annually select a deceased individual to honor with a plaque that hangs outside the Municipal Services Center. Learn about the 2019 inductees and the ceremony here. What better place to come together to talk about history than a historic house-turned brew pub? Join us on Wednesday, June 19 at Somewhere in Particular, 5055 Dierker Road (the old Northwest Title building) for a special treat! 5pm - Happy Hour begins. Start a tab and enjoy all the discounted offerings. 6pm - Gather in a meeting room in the old home for a brief brief on the Society. From there, we will leave on small group tours of the historic house. See a preview of the history. After that - Hang out wherever and enjoy the drinks and food options for as long as you like. Get to know our new Board members and others who share your love of history and UA. Attendees are responsible for their tab and their safe transportation home! Thanks to Somewhere in Particular for their welcome and support of the Upper Arlington Historical Society. RSVP information coming soon - you will have to register for this event, and current members will receive first notice to RSVP…. Visit us in the atrium to learn about our Archives - items significant to UA’s history that we already have, items we would be interested in, and our future plans & dreams. On display will be a 1992 game that’s all about UA! What will you be able to recognize? FREE for all. The State of the City meeting will begin at 6:30pm in Council Chambers. On display for you, from the year 1992! Come see the whole “monopoly” style game board. The Upper Arlington Historical Society welcomes Doreen Uhas Sauer. She will lead a conversation on past Columbus housing patterns which contributed to Upper Arlington's history of being a "restricted home community," along with other cities in our region. Her talk will focus on three main time periods - Pre-Civil War - 1900; 1900 - 1929; and, 1930 - 1960s. Tickets are for pre-registration; please arrive at least 5 minutes before the event begins or you may forfeit your seat. General seating only. Sunday, May 19, at which time a bronze plaque will be added to the limestone wall of the Municipal Services Center Plaza in their honor. 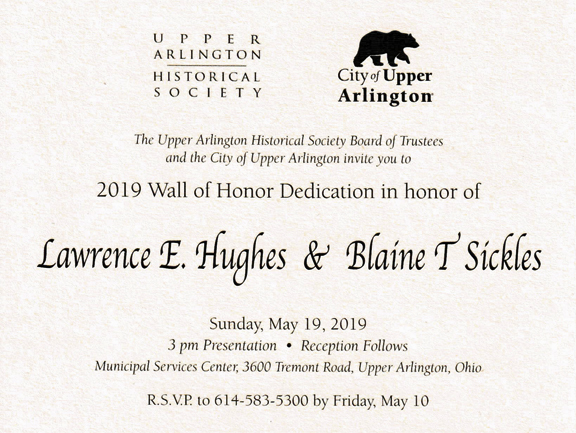 Each year a deceased Upper Arlington resident who contributed greatly to the city, state or nation, by his or her achievements is selected for the Wall of Honor. The idea was conceived by City administration and is a joint project of the Historical Society and the City of Upper Arlington. A ceremony is held in May and a bronze plaque, dedicated to the honoree's memory is placed on the limestone wall in front of the Municipal Services Center. This is the same tour that was SOLD OUT in April, so don't delay! Registration / payment instructions are here. After seeing our trolley in the 4th of July parade, don't miss the evening unveiling of the Centennial Legacy Project commemorating Upper Arlington’s 100 years. The gathering will take place by the new Centennial Plaza in Northam Park in order to view both the bronze bear statues and the History Walk. The History Walk will be located along the main pedestrian walkway into the park from Tremont Road. A series of 10 markers will provide a snapshot of Upper Arlington’s first 100 years—the community’s early days and the people, institutions and amenities that set us apart. The Upper Arlington Historical Society provided the content for these permanent signs, and we will be on hand to celebrate their unveiling. "Discover Upper Arlington - Portrait of an American Town: A Home Movie" was created in 1992-1993. Uncovered in our archives, it provides a snapshot view of our history, from our early beginnings to "a year in the life" of Upper Arlington in 1992. This 45-minute film includes interviews with some of UA's first residents as well as notable Golden Bears Jack Nicklaus and Beverly D'Angelo. It is a perfect time capsule of the early 1990s, waiting for you to discover and remember. And it's FREE. Free movie, free popcorn, free time travel to the 1990s. Recommended for ages 12 and up. Shown in the Council Chambers at the Municipal Services Center. Join us for free "Lemonade and Cookies" at the Municipal Services Center on Monday, June 11 at 7pm before the City Council meeting at 7:30pm. In the spirit of our 100 year celebration, Ann Armstrong Knodt will be serving cookies from her grandmother Susan’s recipe. Susan Armstrong and her husband, Warren A., lived on the second floor of the gun club on 5th Avenue between Arlington Avenue and Cambridge, while their Roxbury Road home was being built and are considered to be the first residents of Upper Arlington. Warren A. was on the first village commission, and their son, Warren C. (Ann Knodt’s father) was mayor from 1958-1964. We invite all to come to discover & celebrate our history through this unique (and FREE) opportunity. The 2018 Wall of Honor induction ceremony is Sunday, May 20, 2018 at 3:00 p.m. at the Municipal Services Center (3600 Tremont Road). All are invited to attend. Refreshments following ceremony. Jacob L. “Jake” Will was an active member of Upper Arlington for 86 years and was the general contractor and owner of J.L. Will & Company. Jake’s passion for the Tri-Village community and Upper Arlington was apparent through his involvement on a number of committees, such as the Northwest Kiwanis Club, the Historical Society’s committee for the Wall of Honor, and the Community Improvement Corporation. Jake was known to make sure something got done if it needed to, like helping develop and build a new picnic and restroom facility at Northwest Kiwanis Park. A graduate of The Ohio State University and a U.S. Army veteran, Jake was a strong mentor, teacher and friend to many of our community’s current leaders. Jeanne (McCoy) Purnhagen Schaal was a resident of Upper Arlington for 33 years, and was an active member in a number of clubs and organizations throughout the community. An employee of Ohio Bell, Battelle, Clyde Williams & Co., and the National Board of YMCA, Jeanne also dedicated much of her time to community service. She was a very active member and the first female president of the Northwest Kiwanis Club, and served as president of the American Business Women’s Association (Rose Capital Chapter). Jeanne was also the founding director and executive director of the Ohio Business Week Foundation that worked to mentor high school students. Clark Pritchett was a resident of Upper Arlington for 31 years. He received his B.A. in Economics in 1965 from The Ohio State University and graduated with his Juris Doctor degree from the OSU College of Law in 1968. Out of college, Clark practiced as an Attorney at Law and was elected to serve on the Upper Arlington City Council in 1998. From 2003-2006, Clark was the Council’s President and Mayor. Clark’s contributions to the community and region will be remembered by the donation of kitchen equipment for the Amelita Mirolo Barn that he helped secure, and the newer downtown Hilton that lifted Columbus into contention for major conventions. J. W. Jones was a resident of Upper Arlington for 22 years. In 1920 J. W. Jones began his work in Upper Arlington schools as the President of Upper Arlington School, later renamed to Upper Arlington High School. At the time of presidency, J. W. taught math and biology to students as well. When the new high school building was constructed in 1924, J. W. was appointed as the district’s first full-time superintendent for 20 years. J. W.’s passion for learning led him to play an instrumental role in establishing The Marwick School of Supervised Play in 1933, the first preschool in Upper Arlington. Throughout his 10 years of teaching and his time as the face of Upper Arlington’s school district he made a huge impact on developing Upper Arlington schools into what they are today. THANK YOU, UA! Our four tours on April 28th are completely full. Please sign up here to receive information in September about our next tour date, Saturday, Oct 27th. 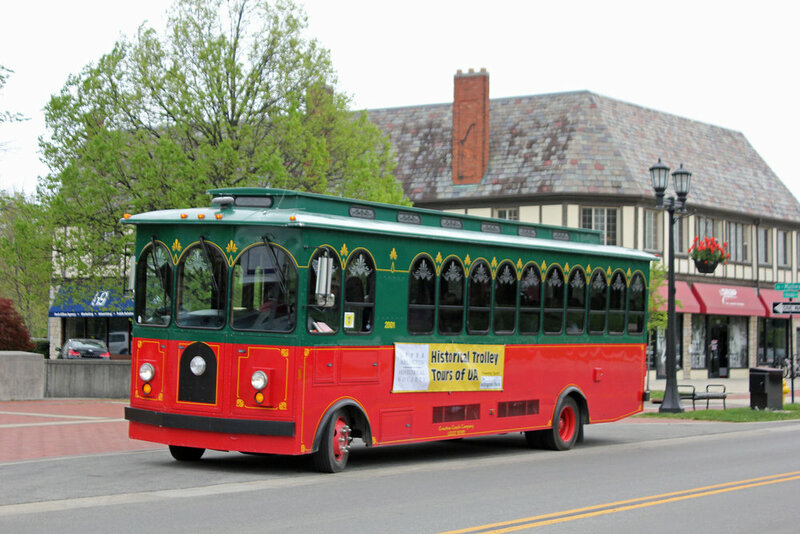 Celebrate Upper Arlington's centennial by traveling back in time -- join us on Saturday, April 28th for a special trolley tour through old Arlington. Please consider reserving your tickets soon, as we have had high interest in this upcoming tour. Just email us with your name, desired tour time, and # of tickets. See details in the flyer below. Your payment will be due once you receive a confirmation email from us. Hope to see you aboard ! * We appreciate our members' willingness to pay the non-member rate for any non-members in your party. Please do not send any payments until you receive an email from us confirming your tour time and # of tickets. Come visit us at the Upper Arlington Community Fair, taking place at the Municipal Services Center prior to the State of the City address at 6:30pm. We will have books available for sale and can answer questions about upcoming trolley tours, the history of UA, or our centennial events. More details on the City's website. SAVE THE YEAR! Celebrate 100 Years of History with the City of Upper Arlington and the Upper Arlington Historical Society. More information is found here. Centennial gear on sale through Nov. 19, 2018. Buy for the holidays! Each year, a former Upper Arlington resident who brought honor and recognition to our community is selected for the Wall of Honor, with a memorial plaque installed on the plaza at the Municipal Services Center. Do you know someone to nominate for this honor? The deadline is January 12, 2018 - see here for forms and details. Participants will be learning about the development and growth of UA's neighborhoods, schools, parks, and business districts. Discover stories that have shaped the Upper Arlington community, receive an educational booklet containing several historic photos, and enjoy complimentary pre-tour snacks! This tour is made possible in part thanks to the support of our Presenting Sponsor, First Merchants Bank, and our Supporting Sponsors, The Wine Bistro and The Wellington School. Please see all our important business sponsors here, and let them know you appreciate their contribution towards making Upper Arlington's history come alive. Previous tours have sold out quickly, so buy your tickets today! Starting at Miller Park Library and ending in the NW corner of Miller Park, this tour discusses UA's first citizens and the general architectural styles popular a century ago, along with interesting facts about the development of our community. This tour requires about 1 mile of walking and is also wheelchair / stroller-accessible. A $5 donation per person is much appreciated. No registration is required; please just arrive at the Library approximately 15 minutes before the tour is to begin. Get an early start on celebrating Upper Arlington's 100th birthday by pre-ordering A Cherished Past, A Golden Future: Celebrating the First Hundred Years of Upper Arlington. A limited number of books are being printed for the Fall 2017 release. Purchase your copy today! The City of Upper Arlington and Upper Arlington Historical Society are pleased to announce that John Austin Dunkel has been selected for induction into the Wall of Honor. Mr. Dunkel (August 18, 1930 – February 6, 2011) was an Upper Arlington resident for 63 years dedicating a substantial part of his working life to the community he loved. 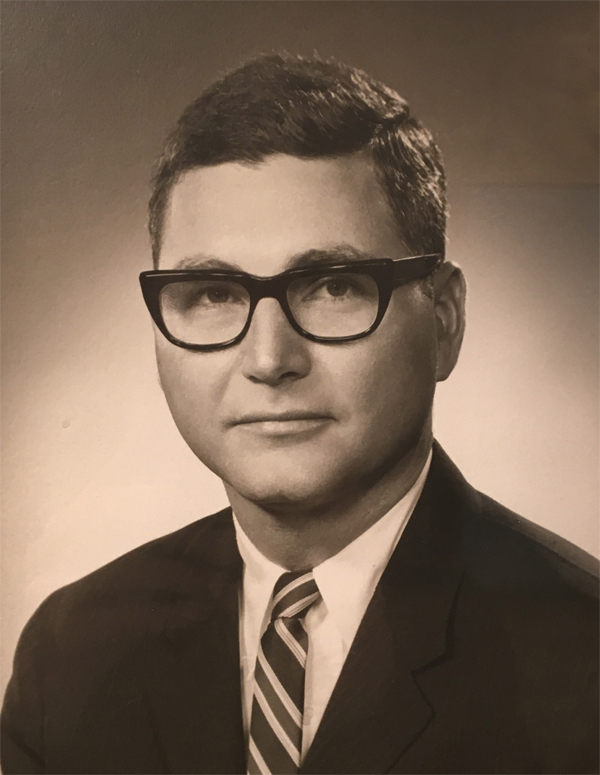 A practicing attorney who rose through the ranks to become a senior attorney at Porter Wright Morris & Arther, LLP, Mr. Dunkel was best known locally for his time serving as Mayor and a member of City Council during the 1960s. He took it upon himself to challenge the Ohio State Legislature relative to a decades-old law regarding the governance of Ohio libraries. With the law overturned, his accomplishment set the stage for Upper Arlington to become independent of the Grandview Library and to establish its own library system. The Upper Arlington Library System has long been considered one of the jewels of this community. With branches on Tremont Road, at the Miller Park circle and on Lane Road, the UA Library celebrates 50 years of service in 2017. 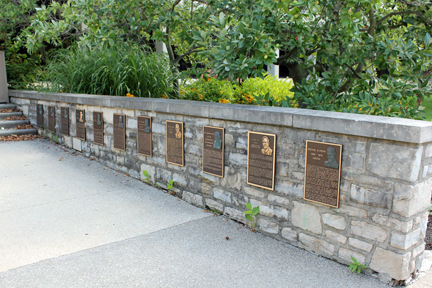 The Wall Of Honor, found outside the Municipal Services Center, honors deceased Upper Arlington residents who contributed greatly to the city, state or nation, by his or her achievements. Did you know that Upper Arlington sits on what was, in the early 1900s, James T. Miller's farmland? Through the estate of his granddaughter, Esther A. Miller, the City of Upper Arlington and The Upper Arlington Historical Society have uncovered a carriage step, used to mount horses and carriages, that was originally located on the farm. Please join us on May 7th as this carriage step and a new historical sign is unveiled at Miller Park near the library. There will be a brief dedication ceremony followed by food, fun, and entertainment.